When you want awesome mobile sound, you want Mega Watt Car Stereo and Security. Whether you’re looking for a seriously loud sound system or want to upgrade your factory radio to a top-quality car stereo, we can make your vehicle sound fabulous! We’ve been serving the mobile electronics needs of the entire Boston area for over 15 years: we have experience and expertise you can count on for the best in car audio. 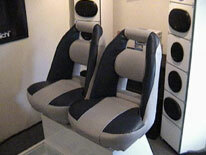 Visit our Marlboro showroom today or call to learn more about enhancing your mobile stereo experience! Mega Watt Car Stereo and Security offers a full-range of car audio components to help you create the car audio experience of your dreams. We have a selection of speakers, subs, amps, and decks, but we also offer high-tech options including HD and satellite radio, iPod integration systems, Bluetooth integration, and more! Mega Watt Car Stereo and Security offers sales and MECP installation on all of our mobile stereo components for convenient one-stop shopping. And, with our custom installation options–including upholstery, fiberglass, and enclosures–we can design a beautiful car stereo installation for your vehicle! 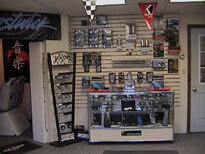 Every customer has their own unique taste in car audio, and at Mega Watt Car Stereo and Security, we believe the best way to find the perfect stereo system is to test it out… Unlike many demo features at mobile electronics shops, our Sound Room enables to you create a custom configuration to find just the right car audio components for your personality and vehicle. From super loud to clear, crisp quality, you’ll love how our Sound Room helps you create the car audio sound of your dreams! iPod integration is a great new option for enjoying your mp3 player while you’re on the road. Unlike the staticky FM transmission systems of the past, today’s iPod integration allows you to directly interface your music player with your car stereo: you get great sound quality, easy operation, and access to the hundreds of songs stored on your iPod! 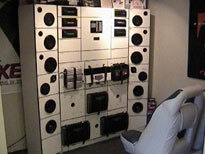 If you’re ready to upgrade to iPod integration, call Mega Watt Car Stereo and Security today. Let us connect your iPod to your car audio system for the best in mp3 music in your vehicle. One of the most popular aftermarket vehicle upgrades today is satellite radio. 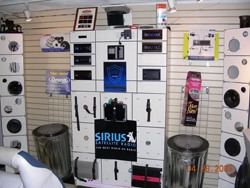 You get superior sound quality and a huge selection of talk, sports, and music stations. Mega Watt Car Stereo and Security offers satellite radio as both integrated CD/DVD/satellite decks and stand alone units, so no matter what type of car stereo system you have, we can add satellite. Call today to learn more about how satellite radio installation can enhance your car audio system! Another high-tech option for fabulous music selection and excellent sound quality is the new HD radio. Increasing in popularity over the last several years, HD radio enables you to get great sound without the additional cost of subscribing to satellite radio! You get the same type of static-free music quality and huge channel selection, but without the fees. If you’re ready to switch to HD radio, call Mega Watt Car Stereo and Security today. The process is simple–all you need to do is upgrade your car stereo to an HD radio receiver and you’re ready to explore the free realm of quality HD radio sound!